Per Scientiam Servita (Service thru Knowledge) is the offical. 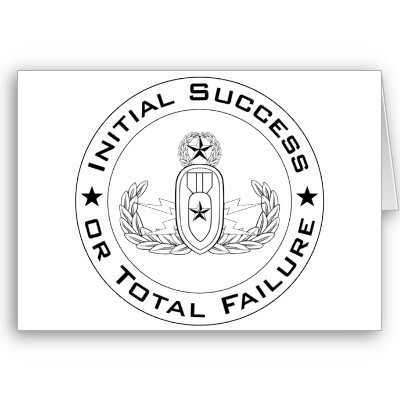 There is a movement afoot to bring back the "Initial Success or Total Failure" motto to NAVSCOLEOD. The Navy is the only group out of the 4 to dump the motto, and only on orders from an Admiral, and only at NAVSCOLEOD. Even the Navy Techs are upset. The Army, Air Force, and Marine Corps do not use "Service thru Knowledge". The "Junk In The Sun"
symbol on the NAVSCOLEOD emblem is service specific. The Junk: Torpedo, Aerial Bomb, Sea Mine, Navy Standard Missile. I've only worked with USN techs so I've no idea what the others use. And I do believe that EOD Techs have the gas in Washington D.C. right now to get this done. Admiral Tillotson painted himself into a corner when he ordered that the motto be stripped from every building, wall, and structure at the new school, because he said Failure is not an option. 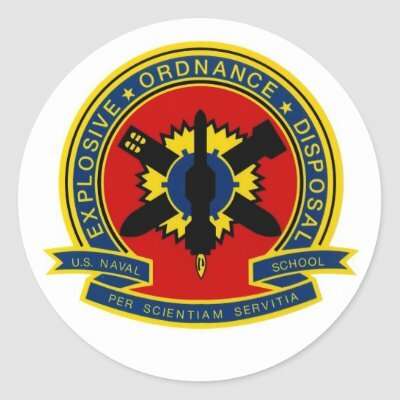 And yet Bomb Technicians can do everything right and still end up with their names on the EOD Memorial, that is why the Motto is Initial Success or Total Failure. It is because of the gravity of the situation, how life and death swing in the balance. Tillotson may be an EOD Tech, but, he has very few friends left in the EOD Community, even in the Navy. This may be the death knell to his military career, turning an otherwise remarkable military career into an infamous military career. As a Marine I was always impressed with the level of training the USN EOD's had, and always wondered why we didn't train to that standard. As a Nasty Girl working with USN EOD I was always embarrassed. Wasn't there every time I was at Indian Head. And besides, EOD calls EOD Techs "EOD Techs" as both men and woman perform EOD duties. Any would-be sign would have read "Our Technicians"
Unless it is the red one. "The border will be declared when the enginners get tired".